This series of posts returns stronger than previous efforts, which is more than I can say about the two seasons I'm about to cover. The Disney seasons had already proved they could do characters right, they could do plot right, and they could build up a season in all the right ways. Mystic Force starts wobbling on the downward path, before Operation Overdrive turns in into a full-on crash. You'll see what I mean as you read on. Mystic Force begins with a tale of the past, about a great war between good and evil, and stopping the human realm being taken over. In the present, four of our heroes work in a music store, with the fifth who will join them arriving on a motorbike. I find it kind of fitting that the main civilian base is a music store, as the music hits all the right notes with this season. A recent earthquake has upset the barrier holding evil at bay, and it starts seeping through the gate, calling for help to be needed to stop it. Nick, who will eventually become Red Ranger, is the only one who willingly goes to help. To help an old man find someone lost in the woods. The four of the music store decide to tag along, and with the five now together, they get taken to the Ranger base of the season – Rootcore – where Udonna explains what needs to be done. She’s the mentor of the season and a Ranger, but the Ranger part only applies to the opening and ending of the season. 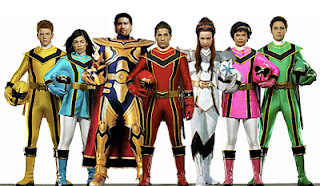 Her powers are taken by Koragg – introducing one of the villains who plays a large part throughout – meaning it becomes necessary to give the five their morphers. Nick wants nothing to do with the entire magical world, and leaves. The idea being that to use magic, you need to believe it. The other four believed, but it takes that bit longer for Nick. Nick, I feel, is someone who believes more in people than concepts, so he can accept magic when it comes to helping those in need. With the Mystic Force now set in motion, the first of the three chapters can begin. Why do I call them chapters? Well, the idea is simple. Chapter one is introducing the core characters and the setting, while building up the present. Chapter two is more focused on the past, revealing good and bad from that time for the Rangers to meet in the present. Chapter three brings the ultimate evil for the Rangers to face, and has good and evil clashing in more ways than one. I’ve already mentioned Koragg, a knight who also has the ability to use magic. Necrolai – the queen of vampires – is also a villain who takes part in all three chapters of the story. She also has a daughter – Leelee – who is at first seen as a civilian more than an evil person. Morticon takes the commander position. 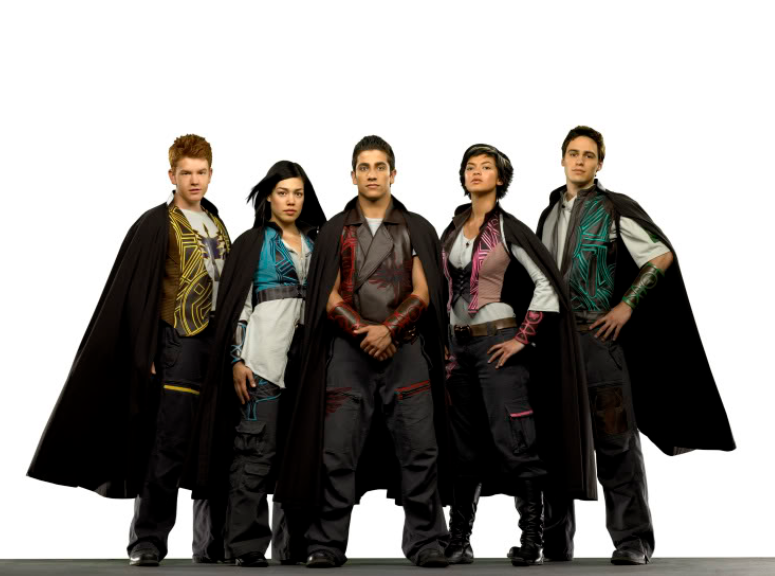 For the good side, it’s just the five Rangers, Udonna, and her apprentice Clare. Phineas – a crossbred citizen of the forest who everyone rejects – runs into Nick, and the two strike a friendship of sorts that builds across the season to include the others at Rootcore, and even some of the villains. Xander is a character who is laid-back, but ready to get serious when the time calls for it. Chip is always excitable, but has a loyalty to his friends that allows him to do the right thing. Vida is also someone willing to protect her friends, and is never shy about making her opinion heard. Madison is the quiet one of the group, but that doesn’t mean she lives in the shadow of the others. After the first few episodes comes one of the stronger episodes from the season. Stranger Within is a two-part episode that focuses on the bond between Vida and Chip, and what better way to do so than make one of the two a vampire. At first, the other three don’t believe Chip, but eventually have to accept it when the proof is shown to them. There’s also the matter that Vida isn’t the only one to have been turned into a vampire, as a multitude of citizens have as well. Beating back the monster cures all of them – except Vida. Necrolai had turned her personally. Chip plays his part to get through to Vida and the two defeat Necrolai. Not permanently, but enough to cure Vida. The character’s who get focus in the episode are done so to a great level, and it is at the end of this episode where Leelee is shown to be a part of the villain team. The ending to the first chapter is also a perfectly crafted episode – another of two parts – which puts the focus on Clare, and her heritage as the child of the Gatekeeper. The Gatekeeper is one who has the power to lock evil behind the gate of darkness, and is up to Clare to live up to that name when the gates rise to the human world and release Morticon. She does so to protect the Rangers, who are in titan form battling the supersize Morticon. This season’s zords are a power-up for the Rangers to supersize them as Mystic Titans, which in turn can form a Megazord. Which is obviously not going to happen if all five can’t turn titan. Clare tries saving the Rangers, but in turn needs saving herself, thus it is up to Nick to battle Koragg and stop the Gatekeeper’s power being used to fully open the gates of darkness. Full of action, high stakes, and a bit of character growth, the finale for the first chapter - in my eyes - reveals itself too soon, as neither of the other two finales really match it. The second chapter, as said, reveals elements from the past and brings them into the present. The setting up of these elements starts with a cave that has a seal stopping any evil from entering. Cue Leelee giving the Rangers news of footsoldiers near that cave. Entering the cave, the Rangers unknowingly break the seal, allowing Necrolai entrance. While the Rangers take a lamp, Necrolai takes a mummy. A frog is also seen within the cave. The mummy is restored to Imperius, who takes up the commander role of the villains after Morticon’s defeat. The lamp contains Jenji, a cat who lives within the lamp and helps the Rangers. When the Rangers eventually show him to Udonna, she asks about Bowen and Daggeron, but Jenji has no idea where they are. Callindor reveals his take on where Daggeron is when he comes for a visit, but a shared mistrust of him between Clare and Phineas is rightly warranted, as Callindor is Imperious, and he’s come to take the secrets of the Mystics. The frog seen from the cave is revealed to be Daggeron, the curse having been broken by Madison. Daggeron confronts Imperious, and stops him from executing his plan. Udonna and Daggeron talk things over. Leanbow is name-dropped, and Phineas seems to know something about the whereabouts of Bowen. He had taken the child of Udonna during the battle and hidden him in the human world. Another great episode comes in the form of Dark Wish. Split into three parts, it shows the consequences of becoming lax about your responsibilities. The Rangers have now formed a disrespect of proper use of magic, and have now fully become accustomed to using it for everything, to the point where even fighting has become a chore. Wanting to wish their enemies away, they use Jenji’s wish granting power to do just that. Except it gets turns on them instead when Imperious captures Jenji and makes the same wish. In a dark world where the Mystic Force doesn’t exist, the Rangers realise the consequence of what they have done, and set about fixing it, all while learning the lesson about not repeating that mistake. It’s when the Rangers start to truly believe in themselves and the cause again that the wish becomes reversed. The set-up in this episode is executed well, and it becomes a journey for these characters that I feel is a worthwhile one for future episodes. Not least because it also grants them new powers in the Legend Warrior mode. It also sets up the finale of the second chapter – which focuses on Koragg. He starts getting memory flashes about the past, about who he was, and slowly starts to break through to his true self. The Rangers are dragged to the Underworld, where Imperious uses their power to free the Master. He gets stopped first by Udonna, who sacrifices her magical abilities by using a dark spell to take her to the Underworld. That sacrifice is followed by putting herself between the Rangers and Imperious, so now her power is being drained instead. Koragg’s memories are finally unlocked, and he saves the Rangers and Udonna. Koragg was Leanbow all this time, and he uses his good side to sacrifice himself to stop the Master fully rising. The mystery of Bowen is also settled, as the only item Nick has of his real parents is the same blanket that Bowen was wrapped up in all those years ago. Since Imperious and Daggeron were together at the start of this chapter, it seems fitting that former is finished by the latter. Out of the three finales, I find this the weakest. It has great character growth, with Koragg being Leanbow handled well. Nick as Bowen… Not so much. It also lacks a certain impact, since Leanbow goes from bad to good, then is captured and returned to bad, then becomes good again upon hearing Udonna reveal Nick as Bowen, with hardly any room to breathe. The idea of Daggeron being defeated to return as help is also spoilt a bit by the fact we see he survives long before his eventual return. If the first part of the episode stretches itself a bit, the second part crams too much in. With Imperious gone, the Ten Terrors rise. Most episodes here focus on battling one of these Terrors, who uphold something called the Laws of Darkness. Any rule breaking is dealt with by another member, and each of the Terrors have unique ways of dealing with the Rangers. Since Necrolai has shunned Leelee in favour of the Terrors, she runs off to the human world. Toby is the manager of the music store where the Rangers work, and hires Leelee as a sixth worker – tired as he is of the Rangers always rushing off to Ranger duties. The Rangers don’t take lightly to this appointment, but can’t say anything to Toby as he doesn’t even believe they are Rangers. Chip was the one who told him, and when the subject comes up again – during a time when the Rangers are feeling defeated – it is Toby who gives the Rangers the idea that defeats the Terror they had trouble against. When he sees them morph while out on another of his jogs, he finally believes they are the Rangers. Between those two periods, Udonna and Clare search for Leanbow, which ends with Udonna captured by the Terrors in the hope of drawing Leanbow out. Leanbow is stopping the Master from rising, something the Terrors want to happen. With Udonna captured, three unlikely people come together to save her. Clare, Phineas, and Leelee. This part of the last chapter is the stuff I like most, with most of the Terror vs Ranger battles feeling like a record on repeat, even when other things are introduced such as the Red Dragon Fire Warrior. Though this is the episode I find myself liking the most, just because of the introduction of the battelizer. With Udonna back, along with Leanbow, and numerous Terrors defeated, the final battle takes place now that the Master has risen. He first takes control of Nick, and father and son battle it out. The love between the two breaks the Master’s control. With that failing, he strikes the source of good magic, and shows the Rangers the future he will rule. The season made it clear from the start Madison was trying for that connection with Nick, and she has been the one to have an affect on him most. This is most clear in this finale, where he's given up. Madison's words are what gets him back into the fight, and the five work together to force through the Master's magic and return to how things were by using the last of the good magic left. Toby and Phineas also get a starring moment in this finale. The two had met previously when the Rangers were taking Phineas to a dentist, and push him onto Toby when Ranger duties call. He was disguised as a relative of Xander's that time, but with the truth about the magical world being revealed to Toby - and the influence of Leelee's relationship with him - Phineas gets hired as another member of the music shop. The general public don't see Phineas the same as those of the shop, and run scared at the sight of him, leading Toby to have to let him go. Most of that had a comedic tone, but it's been building to the moment where the humans and the magical creatures reveal themselves to each other, granting the Rangers their own sort of magic and allowing a final blow to the Master to happen. The magic in question is believing in the Rangers, and you wouldn't be wrong to say it's near enough a match of Wild Force in that specific scene [though an outside source believing in the Rangers instead of the Rangers believing in themselves to continue the fight]. However, it works better here due to the whole theming being about beleiving, whether that be in someone, something, or yourself. That theme makes itself known quite a lot, being on par with the season's magical setting as a visible entity. With evil defeated, Clare takes over Rootcore, Xander becomes manager of the music shop, humans and magical creatures co-exist peacefully, and Nick - along with Udonna and Leanbow - head away from the city on a family journey. Andrew Hartford is an explorer and billionaire, and upon finding the Corona Aurora, releases both Moltor and Flurious – warring brothers who long ago tried to take the crown for their own and were banished to different planets. Six months later, all of Hartford’s preparations are put into action, and four people from across the world are chosen for their talents to become Operation Overdrive. Ronny, a World Grand Prix driver. Will, a professional vault cracker. Rose, a brilliant mind from a top London university. Dax, a stunt double for Hollywood movies. Hartford also has a son, Mack, who feels that his dad should spend more time with him. He wants to get out more, but his dad is overprotective of him. Mr Hartford said he would be joining the four he hired as the Red Ranger, but Mack is the one who gets to be so, with the episode itself giving focus to that particular quarrel. It is agreed that Mack becomes permanent red, and the team is together. The Corona Aurora needs the five jewels it once held to bring the bearer ultimate power. The quest for the first jewel is underway, with the episodes all being character focused. The strongest of them comes from Dax, who gets tricked by Miratrix into revealing the secrets of their mission thanks to the power of love. He’s able to see her for who she really is after thinking things through, and how she seemed a bit too eager to learn everything about what the team are doing. The weakest comes from Rose, in the fact the episode doesn’t really feel focused on her. The episode is where the Rangers get the first jewel, having met with a pirate who leads them to a jewel. Rose might have loosened up a bit thanks to the experience, and shown herself to be a strong-willed person, but that focus seems a bit side-lined compared with the quest for the jewel. The other focused episodes come from Will accepting he needs to work with his team in order to win the day, Mack feeling like he can’t lead the team and losing his confidence, and Ronny gaining an understanding on how her competitive nature affects the team. As for the villains, Moltor is a hot-headed leader, using his power to win the day. Flurious is more a tactical thinker, looking for gaps to exploit in order to get what he needs. Miratrix is after a power to free Kamdor from her pendant, having been helped by him before. She is also crafty, and instead of foot-soldiers, she uses monsters created by Kamdor. However, these three villains are all after the same thing, but it doesn’t feel like it. While Miratrix hunts for the first jewel, being the most active against the Rangers, Moltor and Flurious don’t really seem to be doing much except watching the ongoing fights. When yet another evil team is added to the list, things start to really feel stretched in terms of how they are used. Flurious and Moltor decide to team up to take out the Rangers, allowing them free reign to find the jewels. With the Megazord captured and Mack still inside it, the comedic exchange that follows is perhaps one of the best things about the season. Flurious’ yeti guard – Norg – is watching Mack inside his makeshift cell. Mack tricks Norg into revealing information on the two brothers that will make them start fighting each other again, then once he uses it and the fight breaks out, he escapes. There’s also another problem with the season, and that is it doesn’t really try once it has its mind set on who should become owner of a clue or jewel. Moltor and Miratrix have been fighting over a clue to the second jewel for an episode, then once it reaches the end, and the Rangers knock the clue away from Miratrix, it just drops to the floor, and no-one picks it up. Moltor has disappeared back to his base, despite the fact nothing was preventing him staying. And there are numerous examples of that happening throughout. The second third of the season introduces a new Ranger, and a new villain team. Both are connected, as Tyzonn’s mission before he got cursed by Moltor was to destroy a group called the Fearcats. Moltor has promised Tyzonn he’ll be returned to normal if he follows orders, and those orders include destroying the Rangers. Mack informs Tyzonn of the destruction Moltor will be capable of if he gets the jewels of the Corona Aurora, which makes Tyzonn switch sides. He helps the Rangers get the second jewel, but still wishes he could be returned to normal. Sentinel Knight appears in his ghostly form, and tells the Rangers the power from the two jewels should be enough to return Tyzonn to his normal self. Tyzonn’s story is not over yet, as the next two-part episode introduces those he was meant to stop. The Fearcats are a group of villains that resemble cats, who also want the Corona Aurora for their own. However, there are only two of them, so they try to call forth an army. The backstory of Tyzonn and the Fearcats is the usual villains trick the heroes into losing someone close, but the hero blames themselves for it, but it provides the connection needed for this plot. Tyzonn gains his Ranger powers and defeats the two Fearcats, but they return stronger thanks to Flurious. Thinking he could use them on his side, he uses gyroscopic machines to revive them, only for them to betray him. The qualities of these villains don’t seem to shine that often, and it just gets worse now there are four teams to work with. The quest for the third jewel involves gaining more clues, more handing them off to who the plot wants, and a bit more fighting between evil teams – but again, only when the plot wants it. At this point it’s becoming as repetitive as the beginning of Turbo, where no character development really happens, just stopping the latest villain trap. Once a Ranger shakes things up a bit in that it does at least have some development for these characters. Thrax is the child of Rita and Zedd, and uses his powers to glitch the Morphing Grid so the current team are unable to Ranger up. It’s an anniversary episode, so I’m letting that slide, because that is one super convenient power to have outside of something that forces a team-up. But that’s the key word. Forces. The last anniversary team-up had numerous Red Rangers form a group and tackle a large threat. How they got their powers back isn’t that relevant for the team-up, but for Once a Ranger, it certainly is. Sentinel Knight, a being who has supposedly lost his powers, brings forth five Rangers and restores their powers to be a new team of Rangers. 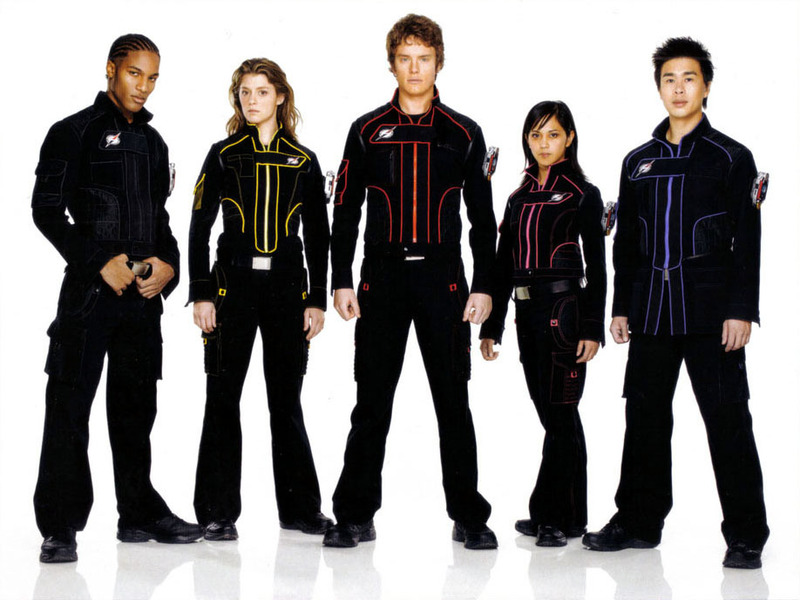 This team consists of Adam, back in Mighty Morphin’ Black. Tori as Ninja Storm Blue, Kira as Dino Thunder Yellow, Xander as Mystic Force Green, and Bridge as SPD Red. As they set about working as a team, a disconnect forms between the two sets of Rangers, and the current team decides they can’t sit around doing nothing and leave. I’ve seen a lot hate about that, but it’s only natural for them to do so. All except one, anyway. Tyzonn’s mission was to hunt down and destroy the Fear Cats. They’re still alive. He’s given up. Even though he’s lost his Ranger powers, he should still be fighting. Maybe he’s become too comfortable with them. The new team decide they need to restore the powers of the current team, so Adam brings in Alpha-6 to restore the Morphing Grid. Mack realises that just because they don’t have the power, it doesn’t mean they can’t help. Sentinel Knight had told him about the sword Excelsior, so Mack heads to London to ask Rose about it. She then starts to realise they can still help, and so the chain begins. All six of them head to the swords location, and claim the sword as their own. Giving that sword to Sentinel Knight restores him to power. The final battle is great, between all evil teams and the two sets of Rangers, with Adam getting a proper morph sequence and a new musical theme. Sentinel Knight comes in to defeat Thrax, and the evil teams all split back to fighting each other. It does the right thing in hitting nostalgia cords – something which Megaforce could have taken tips from. The last third of the season starts dropping hints in its first few episodes that Mack isn’t who we think he is. From Tyzonn’s Mercurian energy failing to bring Mack through a forcefield, to the different memories both he and his dad seem to have of the past, it ends with the revelation that he is in fact a robot. In Things Not Said, Kamdor infects the Rangers’ computer database with a virus to find out the location of the fourth jewel, and that affects Mack. It forms a disconnect between him and the others, but it’s worse knowing that his dad had been keeping this secret from him for so long. And while the disconnect repairs itself with everyone, it takes longer between him and his dad. This is the point of the season where things start to get serious between the villain teams, where all of them become more active. All teams are hunting the Octavian Chalice and the artefacts needed to bring forth its power. The Fearcats manage to steal them all from the other villain teams, unleash the power of the Chalice to create Agrios, and get defeated by the Rangers. Home and Away also features a conclusion of sorts to Tyzonn’s arc, since the Fearcats are now defeated, but deeper than that is the acceptance of what happened. Now that the Fearcats are gone, it’s time for a reflection episode, looking back on the journey of the jewels and who has each one. The location of the next clue is also found by the Rangers, which Rose deduces thanks to the recap. It’s also time for Kamdor and Miratrix to be defeated, with one last fight over a clue. With Miratrix’s failures, Kamdor traps her in the same pendant he was once trapped in, then Will defeats Kamdor while the others are busy elsewhere. Norg also has become something of a stealth-yeti, having found the base of Kamdor and stolen the jewel within it. Not that Flurious was impressed with him. And that leaves the two brothers. Moltor and the Rangers fight over a key needed to unlock the location of the last jewel, and upon his near defeat goes crawling to Flurious with the crown and a prisoner. That prisoner being the woman Tyzonn was going to marry. As thanks for Moltor’s gifts, he gets frozen and shattered into pieces, which is Flurious’ ultimate plan for the world. The finale sees Flurious and his footsoldiers fight in the mansion, and with Mack in the hands of Flurious, the team hand over the jewels they have to save him. That act finally repairs the rift between him and his dad. Knowing you’re more important than the world would have that effect. It is also this relationship that saves the season, providing some good character interactions in a season that hasn’t really delivered the best of any of its characters. Flurious changes form upon placing the crown with the jewels on his head, and the Rangers fight him off, with Mack making the final sacrifice to defeat him. Norg rescues Tyzonn’s partner, fighting off the footsoldiers left behind to destroy them both. Sentinel Knight restores Mack with the recovered crown, removing all traces of the machine he once was. One last meeting outside the mansion sees Norg appear, allowing Tyzonn to reunite with his partner. Mystic Force is a good season offering a lot of action and character building, but falls short of being one of the greats due to the mentioned reasons above. That first chapter being as great as it was left an impression that wasn't repeated in the next two. As for Operation Overdrive, it felt mostly flat, with a few saving graces. The anniversary team-up certainly helps boost it a bit, but doesn't make up for mostly flat characters and a middle section that feels like a loop. Mystic Force had such a loop as well, but could at least diversify how they were dealt with. Overdrive's failing was much the same as other seasons that have tried going against the source material - it never feels right to do so. There's also budget reasons to think about, which also caused Overdrive to fail at feeling like what it wanted to be - a world adventure. 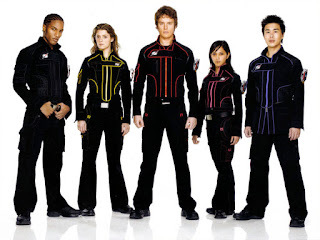 It's a fun, but faulty and forgettable season, while Mystic Force at least has some really strong episodes to help put a few seasons between itself and Overdrive. From the failings of these two seasons comes two that pick up the pieces again, with one delivering some great characters and some great arcs for characters, and the other being a more grounded version of In Space.